When you see the ingredients in this recipe, you will know that we are not exactly following the rules of healthy cooking. This is the richest dish we’ve created so far, but I just couldn’t help myself! The sweet potatoes looked so great at the market this week, and I have been wanting to give gnocchi a try. Likewise, sage makes me smile when the cooler weather arrives. When you see the ingredients in this recipe, you will know that we are not exactly following the rules of healthy cooking. This is the richest dish we’ve created so far, but I just couldn’t help myself! The sweet potatoes looked so great at the market this week, and I have been wanting to give gnocchi a try. Likewise, sage makes me smile when the cooler weather arrives. So, my advice is to get a great workout in with me or my team, and brace your body for some decadence. Serve with a big green salad, and a glass of light red wine. Bake the potatoes the night before. This will at least break up prep time of this flavorful dish. With the potato baked, mash them in a large mixing bowl (make sure that you have 2 cups of mashed potato), then adding the ricotta, nutmeg, and salt/pepper to taste. If you have a countertop mixer, turn it on then start the sauce. Melt the butter over low heat, then whisk in 1/3 cup flour. Slowly add milk, sage, and stir continuously. Add salt and pepper to taste along the way. As the sauce thickens, return to the business of making the gnocchi. Fill a large stock pot with water and a bit of salt, then turn on high heat so that it will be boiling when the gnocchi is ready. With the potato, ricotta, and spices well blended, slowly adding the 1 1/3 cups flour in 1/3 cup increments. You’ll use the remaining flour when it comes time to handle and prep the gnocchi. Once the mix is doughy, remove it from the bowl and place on floured counter. Spilt into 4 sections and roll out into one-inch ropes. Cut one-inch segments, then use a fork to tine the cut sides of each piece and place on a baking sheet lined with wax paper or parchment. Gently drop 8-10 pieces at a time into boiling water, and cook for 2-3 minutes or until they float to the top of the water. Drain in a collander. Stir the walnuts in to sage sauce, then mix thoroghly with gnocchi. Top with a bit of parmesan cheese and definitely be sure to have a salad before or with this dish. It’s very rich, but very yummy! This week we have made a spin on kugel, a traditional Jewish dish that is already meatless. 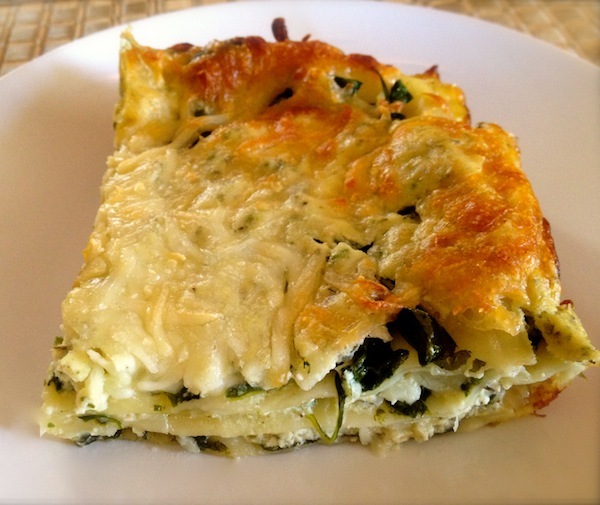 This spinach & squash kugel is a fantastic total meal in a single dish, perhaps served with a salad for some additional roughage! Note: This recipe yields a family sized casserole dish, so half the recipe if you are serving four or fewer people. Preheat oven to 425 degrees. Cut squash in halves, remove seeds and place in roasting dish face down. Pour 1/2 cup of water in bottom of dish, cover with foil, and roast for 20-25 minutes. You want the flesh to be cooked but not mushy. Remove from oven and cool (I put them in the freezer to cool completely for about a half hour while preparing the rest of the ingredients). Cook egg noodles (add a little salt to the water). After straining, shock the noodles in cold water to stop the cooking process and set aside. To make the yummy sauce, melt butter over low heat (don’t let it burn), stir in flour and cook for a couple of minutes. Slowly whisk in milk, add salt, pepper, and nutmeg, then cook over medium heat until sauce thickens. Remove from heat, and add chopped spinach and ricotta. Blend with a spoon thoroughly and set aside for a few moments. If your oven is still on, turn it down to 350 degrees and wait for proper temperature (otherwise, preheat it again). Rub baking dish with oil. Remove squash from fridge/freezer, cut squares into cooked halves then scoop out squares into a bowl. Some of the softer, mashed pieces can be used with the cheese on top when you get to the assembly. Mix noodles with sauce thoroughly making sure that all of the noodles are coated. Spoon and spread 1/3 of noodles into baking dish. Drop squares of 1/2 of squash into dish, then add the next 1/3 of noodles, followed by the remaining squares of squash, and finishing with the remaining 1/3 of noodles. Sprinkle cheese on top and dollop any smaller mushy pieces of squash (this will add additional color to the dish). Bake covered for 20 minutes, then remove cover and bake for another 15 minutes or until cheese browns. Cool but serve warm. We want to thank inSHAPE clients Rebecca Reich and Anna Suh for their contributions to this dish. It was great fun inventing it. If you want a taste of it, book a session with Kim. Her tiny family of three should have plenty left, and will need a year to finish off the completed dish! perfect dish for Meatless Monday. Or any other day of the week! Served with a green salad, this meal is not to be missed! Garden tomatoes and fresh corn are superstars of the summer plate, and this dish blends their flavors with a creamy, herbacious base. Served in a blended pie crust that gives your body the protein it needs, its a perfect dish for Meatless Monday. Or any other day of the week! Flour blend: We used a blend of Cinque e Cinque chick pea flour from Lucini Italia, which we mentioned in a previous recipe with traditional flour for our crust to add protein content and reduce empty calorie load. Granted we aren’t concerned with fat content in this recipe, but to make it a complete meal, we suggest experimenting with flour mixtures that offer a little more than enriched white flour. Flour the counter or another work surface, and divide dough in half and roll out pie crusts. Gently lift into a lightly buttered 9-inch pie pan. Secure crust and trim edges as desired. Fold top half and place in the fridge. Once you get through this step, go ahead and preheat oven to 400°F, and ensure that the rack is in the middle. Slice a one-inch X in bottom of each tomato and blanch in a large pot of boiling water 10-15 seconds. Immediately transfer to an ice bath to cool. Peel tomatoes, then slice and remove seeds (you just want the fleshy part). Arrange half of tomatoes in crust, overlapping, and sprinkle with half of corn, one half of basil and thyme, 1/4 cup onion, 1/2 tsp salt, pepper and one cup of grated cheese. Repeat layering with remaining tomatoes, corn, basil, chives, salt, and pepper. Whisk together mayonnaise and lemon juice and pour over filling. Sprinkle with remaining cheese and cover with top pie crust. Pinch edges to seal. Cut 4 steam vents in top and brush with melted butters. Bake 30-35 minutes, or until pie is golden. Cool on a rack for about 20 minutes before serving. Eggplant is a garden delight, and the parmesan style of preparing it remains a favorite. However, the thinly cut, heavily breaded style is boring and a little too heavy on the starchy carbs, so we did some research and came up with a flavorful version that is twice baked. Eggplant is a garden delight, and the parmesan style of preparing it remains a favorite. However, the thinly cut, heavily breaded style is boring and a little too heavy on the starchy carbs, so we did some research and came up with a flavorful version that is twice baked. With whole wheat or quinoa pasta, this dish is a testament to the diminished value of meat on the plate! Cheers to Meatless Monday! Lasagna is such a treat for a family meal. Creating this meat-free lasagna is pain free, and can be prepared on any work day. This tomato-free version includes a mixed blend of ricotta cheese, and whipped white beans with herbs. Along with spinach, it’s a total health meal! Just don’t eat it all in one sitting. Preheat oven to 375 degrees and either spray a deep baking dish with non stick spray or lightly coat it with olive oil. Our Delverde lasagna noodles suggest a soak in warm water for a few moments before the preparation. In a skillet over high heat, drizzle about 2 tbsp EVOO then saute garlic, celery, and onions for 4-6 minutes, until onions are almost clear. Set aside. Steam spinach if using fresh, drain and set aside. If using frozen, ensure that veggie is thawed and totally drained. Whip beans, parsley in a mixing bowl, and once completely pummeled, add ricotta, herbs, egg, salt and pepper. Blend completely. Prep noodles as directed. Spread sauteed onions and celery in the bottom of the pan, then set up a later of pasta, followed by a layer of spinach. Evenly dollop the cheese and bean mixture, then sprinkle mozzarella. Repeat two more times, ending with a heavier layer of mozzarella at the end. Bake for 45 minutes uncovered, or until cheese is bubbly. For some ovens, you might need to turn the oven to broil for the last 3-5 minutes. Sometimes, a warm, hearty salad is your best dinner option during the work week. An even better reason to honor Meatless Monday, this salad also celebrates foods that promotes heart health. It takes less than 20 minutes to prepare and will not leave you feeling like you need more. Prepare quinoa on the stove according to packaging instruction, and pour into a salad bowl to cool. Wash then steam kale for about 2-3 minutes, and remove from pot to cool. In the meantime, start the dressing. Combine one half of the avocado, parsley, salt, pepper, lemon zest (about a teaspoon), and juice from the lemon (add gradually, so that you can taste it) in a bowl or blender pitcher. Liquify completely then adjust ingredients to taste. 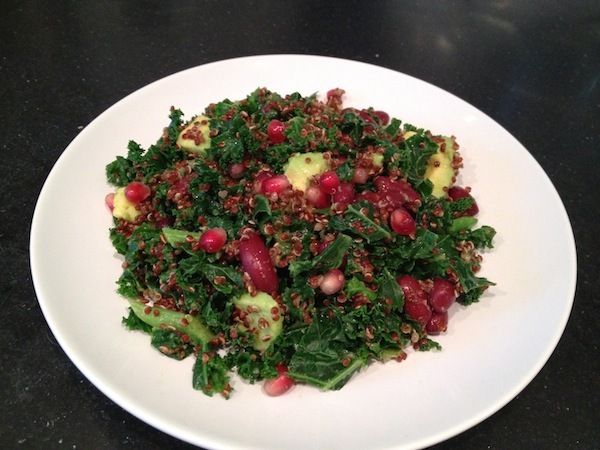 Add kale to salad bowl and toss with dressing. Cube the remaining half of the avocado and dot the top of the salad, along with pomegranate seeds and kidney beans. Serve immediately.